Deane, surely, being a principled man, you should consider resigning your membership of the ETS until they impose quotas on presentations? 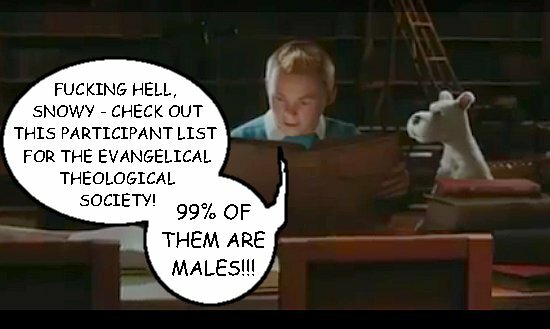 Aw jezuz thanks Tintin and Snowy – but the reason we don’t go, isn’t very academic. You see Tintin and Snowy, ETS just isn’t academic. Drop the S and substitute an A and you have peanut butter. Girlses are busy multi tasking souls and we just don’t have time to go to the circus and watch a bunch of clowns. Even as a kid I never liked circuses – the clowns were a bit pathetic, and I only watched the trapeezers in the hope their elastic would bust so they’d fall. And everything else – well it was just circles, eh. Basically alot of pathetic, stretching in circles revolving around itself. I’m a woman paying my way through clown college teaching undergraduate bible studies at a soft complimentarian divinity school and I find that analogy offensive. 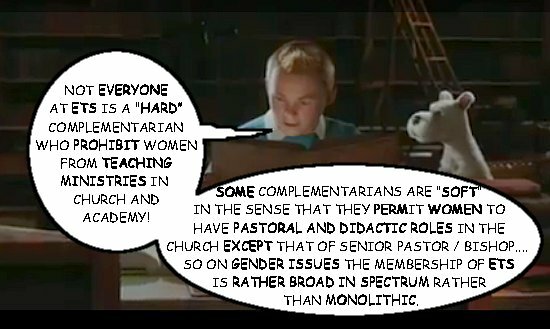 Seriously, though, I wonder if there’s a parallel discussion going on on some other blog about a clown conference where they’re saying that women clowns and women in clown college wouldn’t want to go see a bunch of fundamentalists fiddling around anyways. How would complimentarians approach the issue of women clowns anyway? :-) there’s a fable, the fistful of furies. There’s now a fist fool of clowns. Ugh – I just forced myself to read the post. It’s soooo painfully patronising and naive it just reinforced everything it said it wasn’t. I thought your post just might be a bit of a parody but it wasn’t. Surely we don’t need any reason other than the basic circular operating procedure of their discourse to ignore the ETS, do we? Like the Tea Party movement in the US, instead of quibbling with such organisations, we should just be dismissing them in the bluntest possible language, like Tintin here. Eric: As your own circular reasoning.. both ad hoc & ad hom, as birds of a feather flock together! Sorry, but this is certainly not scholastic reasoning either! If people don’t like the ETS, then move on! *Note, I am not a member of the ETS myself, but I am not adverse. If you don’t like what’s said here in Dunedin, you should move on Father Bob. Mind you, you’re cheap entertainment, like Tintin. Note: I’m a Dunnagirl of the Octagon. It’s official. I was rather surprised that it was Deane who sent me a personal e-mail, and invited me back to the Dunedin blog. I did not know you guys were back in business. So check with Deane. I am always gonna be a Dunedin antagonist, ya know that! :) I am a consummate conservative, both biblically & politically. *But I am “cheap” nothing, I cost baby! I remember when Father Bob first started posting ’round these parts and I got a few emails asking if he was some character I created. No, I am the real deal.. a creature and creation of God, through my Irish parents (RIP) and larger Irish family, though too something Anglo-Irish also. Born and baptized Roman Catholic, and later made regenerate by the grace & glory of God, in Augustinian fashion! soli Deo gloria – glory to God alone! Here I live, and here I will die! Roles? God’s creation? Human sin? Well you know “it’s far far far better to be wrong than boring”, but Paul was both wrong and boring. You stick to your Paul – he was probably impotent even with the young boys. I know it’s just a trick of the search engine, but the name Tony Blair should always be bathed in such holy golden luminescence, like the red words of Christ in the Bible, or like an ex-Serbian militia commander has just taken a piss on him in holding cell in the Hague. Indeed when you cannot debate or attack the issue, then attack the man! > Ad hominem. Lot’s of that going on here at “Dunedin”!